Duplicate content on your website is sometimes said to harm your search engine optimisation. It may not be such a serious problem as this article explains. 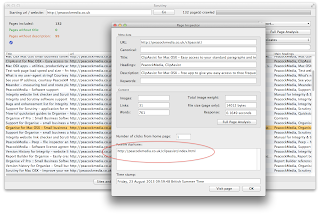 Here's how to check for duplicate content on your site using Scrutiny. 1. First scan your site. If your site isn't already in the sites list, press 'New' and type your starting url. Press 'Next' to see the default settings, press 'Next' again to accept those settings. Press 'Go' beside 'Check for broken links'. You'll now see possible duplicates highlighted in orange. 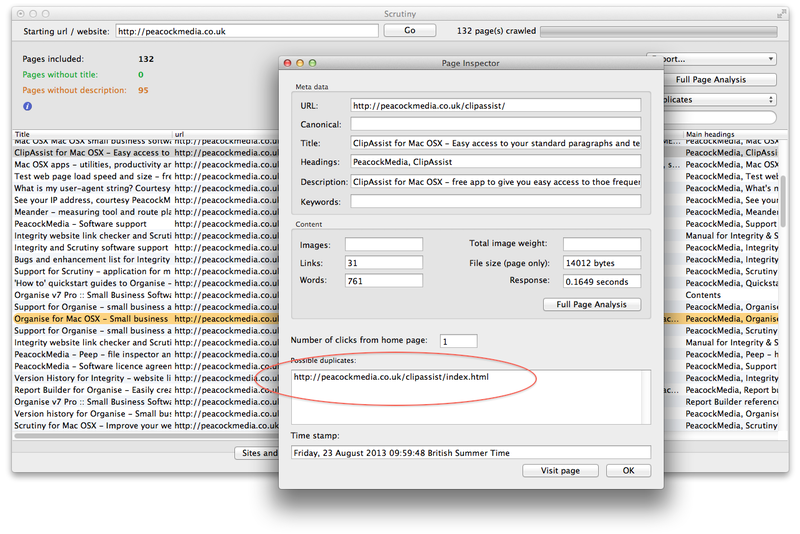 To see a list of the pages that Scrutiny thinks are duplicates for that url, double-click it to open the page inspector. If you want to deal with this problem, here are two ways. 1. If you know that every page on your site has a unique title, then tick 'page titles are unique' on the Settings tab. Scrutiny will use page titles to make sure that it doesn't list the same page twice. However, this won't give you the control over which version is included in your sitemap.